Bart Barford is eager to get back into the 2015 Freightliner Coronado 114 with a 58-inch XT sleeper cab, pictured here with Mills Freightlines’ 50-year anniversary trailers. Mills Freightlines’ new 50-year 2015 Argosy with A-B triples. 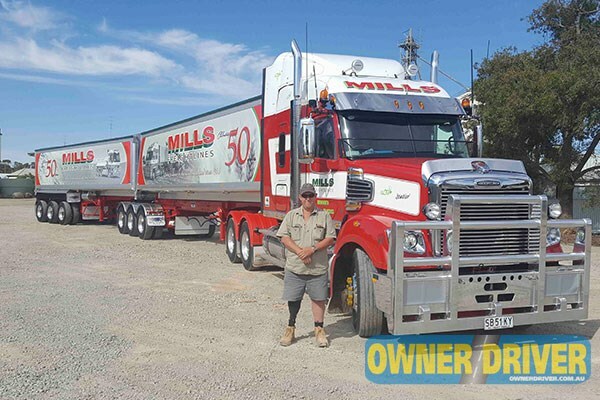 Paul Mills is celebrating Mills Freightlines’ 50th anniversary. The grain harvest is in full swing and Mills Freightlines of Brinkworth, South Australia, is busy carting grain throughout the state’s Mid-North. It is a busy end to a milestone year – 2016 is the business’s 50th anniversary. Mills Freightlines was founded by the late Bob Mills who began carting farm supplies in a Ford Thames Trader in 1966. Bob’s son Gavin continues the company with his wife Margi. Their children Paul Mills and Toni Ashby also work at Mills Freightlines. Paul’s wife Jayne works there too, and their son Thomas represents the fourth generation. Having a strong management team makes it possible for Paul to spend time on the road. From March until August each year he spreads gypsum on farms in the Mid-North, Upper-North and Yorke Peninsula with a Mercedes-Benz Actros 2644. 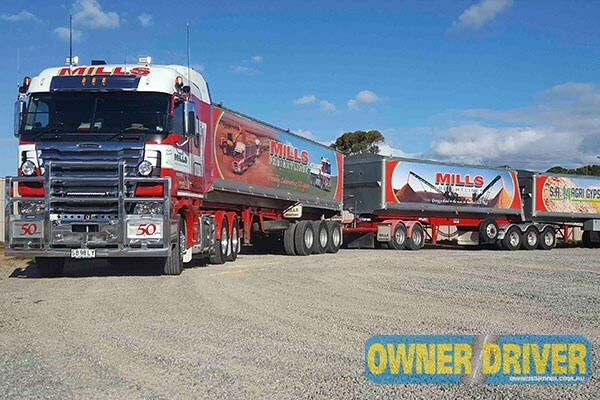 The Mills family owns 23 trucks, including 11 used by its recycling division, Clare Valley Waste. The 12 trucks in the red-and-white Mills Freightlines fleet are all from the Daimler stable and specialise in bulk cartage for farming clients. Paul has been visiting Daimler Trucks Adelaide since he was a baby in Gavin’s arms. Back then it was a Mercedes-Benz dealership. 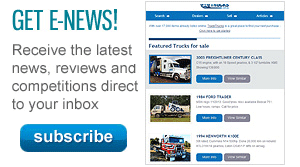 Their newest trucks are a 2015 Freightliner Coronado 114 with a 34-inch sleeper cab and a 2015 Freightliner Argosy. Black-and-white photographs have been reproduced within the trucks’ white stripes in celebration of the 50th anniversary. 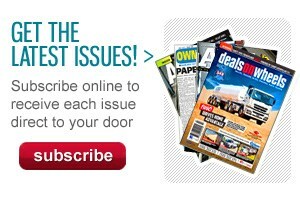 Paul says staff have been an important part of Mills Freightlines’ history. Shane Verran has worked for the family for 38 years. Bart Burford has spent 21 years with the company. He returned to work in November after a leg amputation. Bart is optimistic his MC licence will be reinstated before the end of the grain season.